A new theory holds that Earth might have received the elements it needed for life to form from a massive collision with a Mars-sized planet. 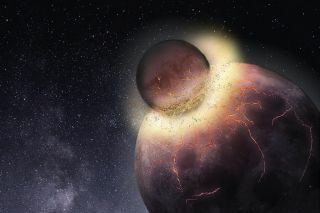 The ancient collision that formed the moon may also have brought with it all the ingredients needed for life, a new study finds. Over 4.4 billion years ago, a Mars-size body smashed into a primitive Earth, launching our moon into permanent orbit around our planet. But a new study finds that this event could have had a much larger impact than previously thought. The collision could also have imbued our planet with the carbon, nitrogen and sulfur needed for life to form, scientists reported today (Jan. 23) in the journal Science Advances. Elements in the noncore parts of our planet, called the "bulk silicate Earth," can intermingle with each other, but they never interact with the elements of the core. Though some volatiles existed in the core, they couldn't make their way to the planet’s outer layers. And then a collision happened. One theory holds that special kinds of meteorites, called carbonaceous chondrites, slammed into Earth and gave the bulk silicate Earth these volatile elements. This idea rests on the fact that the ratios of different versions — or isotopes — of nitrogen, carbon and hydrogen seem to match those found on these meteorites. So, proponents of the theory argue, the meteorites must be the source of these elements. But there's just one problem: the ratio of carbon to nitrogen is off. While the meteorites have about 20 parts carbon to one part nitrogen, Earth's noncore material has about 40 parts carbon to each part nitrogen, according to study author Damanveer Grewal, a fourth-year Ph.D. student in the Department of Earth, Environmental and Planetary Sciences at Rice University in Houston, Texas. So, the study authors' group decided to test another theory: What if another planet brought the goodies? "Earth could have collided with many different kinds of planets," Grewal told Live Science. Could one of those planets have given the bulk silicate Earth the correct proportion of elements? If this collision happened, the two planetary cores would have merged and the two mantles would have merged. So, they set out to create a possible planet that could have collided with our own. In the lab, in a special kind of furnace, Grewal and his team created the high-temperature, high-pressure conditions under which a planet’s core might form. In capsules of graphite (a form of carbon), they combined metallic powder (which represents the core and includes elements such as iron bound to nitrogen) with different proportions of silicate powder (a mixture of silicon and oxygen, meant to mimic the hypothetical planet’s mantle). By varying the temperature, the pressure and the proportions of sulfur in their experiments, the team created scenarios of how these elements could have divided between the core and the rest of the hypothetical planet. They found that carbon is much less willing to bond with iron in the presence of high concentrations of nitrogen and sulfur, while nitrogen bonds with iron even when a lot of sulfur is present. So for nitrogen to be excluded from the core, and be present in other parts of the planet, it should have contained very high concentrations of sulfur, Grewal said. They then fed these possibilities into a simulation, along with information about how different volatile elements behave, and the present-day amounts of carbon, nitrogen and sulfur in Earth’s outer layers. After running over 1 billion simulations, they found that the scenario that made the most sense — the one that had the most probable timing and could lead to a correct ratio of carbon to nitrogen — was one that posited a collision and merger of Earth with a Mars-size planet that contained about 25 to 30 percent sulfur in its core. This theory "is very probable," said Célia Dalou, an experimental petrologist at the Centre de Recherches Pétrographiques et Géochimiques in France, who was not a part of the study. "This work is a very successful result of years of research of various different teams."